PHR4MWR is very happy to report that earlier today, the appeal that REM had originally made to the Ontario Municipal Board (OMB) was defeated. They had been appealing the Municipality of Port Hope’s unanimous July 2014 decision to reject REM’s re-zoning application. Late last week, REM had dropped out of the case, leaving only the landowner remaining in support of the appeal. The Municipality of Port Hope put forward a motion to dismiss the appeal given that REM was no longer involved, and today the OMB accepted the town’s motion to dismiss, bringing the case to an end. Today’s decision is a significant victory for our organization, for the residents of Port Hope, and for town council. PHR4MWR would like to thank Mayor Sanderson and town council for their steadfast opposition to the incinerator project. Most importantly, we want to thank everyone in the community who came together to oppose this project over the past few years, including the many individuals who attended the OMB pre-hearing earlier today. Each phone call made, e-mail sent, letter written and meeting attended has been critical in slowly but surely putting an end to the incinerator proposal. There is still work to be done. Moving forward, PHR4MWR will be working proactively with the relevant levels of government to put in place measures to protect our community from potential future incineration proposals. We will also be fundraising in order to pay off the legal fees we incurred in hiring our own lawyer for the OMB process against REM (any donations would be welcome, please send to: PHR4MWR, P.O. Box 564, Port Hope, Ontario, L1A 3Z4). But while there is still more work to be done, the fact remains that today was a huge victory for our organization, and for our town. It is time for celebration, and to finally take down the “say no to mega incinerator” signs! Reminder about the Ontario Municipal Board (OMB) “Pre-hearing Conference” which will be held this coming Tuesday March 17th at 10:00 a.m.
We urge all who are opposed to the construction of the mega-incinerator in our beautiful town to be at this meeting if at all possible, and bring as many friends as you can. This will not be a political meeting, and no active participation by citizens is required. The mere presence of a quiet and respectful but substantially sized audience of concerned citizens will convey the sense of the people’s disapproval both of the incinerator project and of the proponent’s attempt to circumvent the democratic wishes of the community. We hope to see you there Tuesday March 17th at 10:00 a.m. in the Town Park Recreation Centre at 62 McCaul Street in Port Hope. At the municipal level, concerning REM’s appeal to the Ontario Municipal Board (OMB), we have strong assurances from Mayor Sanderson and council that they will vigorously defend the former council’s decision to reject REM’s municipal applications. An OMB pre-hearing has been set for March 17th. Further details can be found below. At the provincial level, while we recently learned that REM has withdrawn its provincial application, apparently REM intends to re-apply once they have completed additional studies. PHR4MWR will continue to monitor the situation and urge the province to refuse to grant any approvals given the proven risks the incinerator poses to human health and the environment. Long story short: While REM has lost a series of battles, the war is not yet over. While we are cautiously optimistic that REM is losing momentum, we must remain vigilant in order to ensure REM’s incinerator proposal never becomes reality. That said, we are incredibly proud of how the community has come together to oppose this project. Thanks to all of you for your time and energy: each phone call made, e-mail sent, letter written and meeting attended has mattered. There is no doubt that REM and its proposal have been dramatically weakened by the outpouring of consistent community opposition. In the new year, rest assured PHR4WR will continue to monitor the situation, and will continue to be in touch with you providing suggestions as to how you can help make sure REM’s proposal never becomes reality. The good news is that we have a strong commitment from the current mayor and councilors that they will vigorously defend the former council’s decision to reject REM’s application. Separately from the municipal approval issue, REM would also need to get provincial environmental approvals in order to build their incinerator. Specifically, they would need approvals from the Ministry of the Environment (MOE). In September 2013, REM filed a “notice of completion” submitting their provincial environmental studies and reports in order to get the required MOE approvals. PHR4MWR submitted a thorough and well-researched “elevation request”, urging the MOE to subject the project to additional scrutiny before granting the approval. The MOE then said that before they would make any decision on REM’s application, REM would need to submit an additional study (a human health and risk assessment – a HHERA). REM had repeatedly said that they would have the HHERA completed by December 2014. Instead, in early December, REM withdrew it’s MOE application, but indicated that it intends to re-apply for MOE approval once it has completed additional studies including the HHERA. Because REM withdrew from the MOE approval process, the MOE did not ultimately make a decision on PHR4MWR’s “elevation request”, though the public is free to re-submit elevation requests if/when REM re-applies for its provincial approvals. Thanks again to all of you for your support. Please see following articles regarding the vote! Click and read, Port Hope citizens, Your future needs you – now! And show up on July 24th. re: zoning amendment application by Entech-Rem. TAKE NOTICE that the Council of the Corporation of the Municipality of Port Hope in accordance with Sections 17 and 34 of the Planning Act will hold a Public Meeting on Thursday July 24, 2014 at 6:00 p.m. at the Town Park Recreation Centre (62 McCaul St., Port Hope) to consider a proposed application submitted by ENTECH-REM Canada Inc. on behalf of 1804837 Ontario Inc., for an Official Plan Amendment and Zoning By-law Amendment for lands municipally known as 1516 Wesleyville Road in the Municipality of Port Hope. The subject lands are located on the west side of Wesleyville Road and south of CN rail tracks (see Subject Lands Map). The project is also subject to an Environmental Screening Report as well as subsequent Environmental Compliance Approvals through the Ministry of the Environment in accordance with the Environmental Assessment Act. 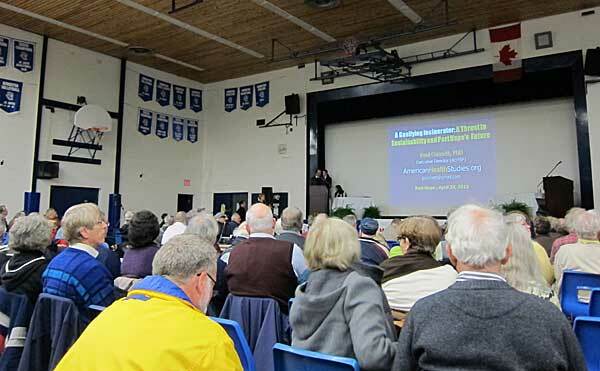 THE PURPOSE of the public meeting is to formally present the draft Official Plan Amendment and proposed Zoning By-law Amendment to members of Municipality of Port Hope Council and the public, and to provide an opportunity for public comments to be made to Council on the proposed amendments. THE EFFECT OF THE PROPOSED AMENDMENTS would be to re-designate the subject lands from “Employment – General” to “Employment – Power Generation” in the Port Hope Official Plan; additionally, the proposed Zoning By-law Amendment seeks to change the subject lands from General Employment, Holding Provision One ‘EMP1(H1)’ Zone to a Power Generation Exception No. 101, Holding Provision One ‘EMPG(101)(H1)’ Zone, in order to permit a proposed Power Generation Facility (with accessory Waste Management and Recycling Facility components). ANY PERSON may attend the Public Meeting and/or make written or verbal representation either in support of, or in opposition to the proposed amendments. Should you be unable to attend the Public Meeting, your written submission will be received at the address given below up until the time of the Public Meeting. ii) may not be added as a party to the hearing of an appeal before the Ontario Municipal Board unless, in the opinion of the Board, there are reasonable grounds to do so. 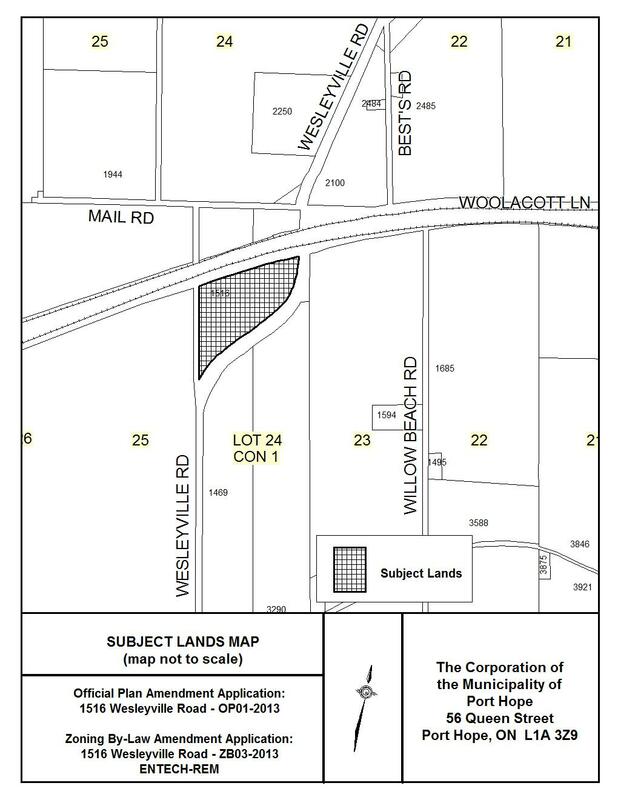 INFORMATION relating to the proposed amendments (including the proposed wording for the amendments) is available for review between 8:30 a.m. and 4:30 p.m. at Municipal Development Team Office at 5 Mill Street South, Port Hope. DATED AT THE MUNICIPALITY OF PORT HOPE THIS 16th DAY OF JUNE 2014. 2. To get a minimum of 66% of voting age residents out to the municipal election in October. Look for canvassers in your neighbourhood, wearing STOP the mega-incinerator t-shirts or check back to this website when we list places you can go to sign the petition. We believe that thousands of signatures will help our cause with all levels of government, particularly the Ministry of the Environment and the Ontario Municipal Board should REM’s application get that far. Let’s STOP them dead, now! Can we revive 12,000 years of stewardship? Please read this column that appeared after REMs presentation at Hamilton Township. We know that we have sent emails about a number of events happening, but feel many may not know about the following meetings, so sorry about the short notice. This Wednesday, April 9, 2014, the Municipality will hold two open house to discuss the Official Plan Review; one at the Canton Municipal Office from 3:00 – 5:00 p.m. and one at the Port Hope library on Queen Street from 6:00 – 8:00 p.m.
We had hoped that the initial meeting would be the one involving public participation in the workshop, with the consultants listening to our ideas. However, the first of the meetings (April 9) will be of the consultant’s presentation of their ideas of what we ‘the public’ want. Fortunately, as well as questions on their presentation, there will be an opportunity for us to present our ideas and concerns. Comment sheets can be filled out at the meeting. Much of the land is environmentally sensitive, with designated wetlands and woodlots, flood planes, ANSI’s (Areas of Natural and Scientific Interest), areas of habitat for Species at Risk. Some of the land is archaeologically sensitive. A major Iroquois settlement and burial grounds have been uncovered in the area. The land north of Lakeshore Road have always been in agricultural use, not employment. The employment designation is a historical mistake, based on the existence of a major generation station which never happened. And it’s not just about Wesleyville. The new County Official Plan wants to designate a large parcel of land north of 401 for even more of those big factories. The hamlets of Port Hope (Welcome, Canton, Garden Hill, etc.) are vulnerable to development pressure. Which should be permitted to grow? Which should be limited to existing development? What areas should be restricted due to environmental constraints? These are Official Plan issues. What’s going to happen to our waterfront? Whether you want to address these or any other issues; whether you just want to listen and learn what’s going on in our community, please attend either or both of the open house sessions. This could be our one opportunity to tell the consultants what we want to see, before their report is cast in stone. Next week on Tuesday, April 8, 2014 at 1 PM, Entech-REM will be doing a presentation to the Hamilton Township Council. This is the same council that Dr. Stan Blecher spoke to a few weeks ago. We will not be able to direct any questions to the presenters. Please come and join the many citizens that will be in attendance to express opposition to their position. south of the village of Camborne. Municipal building is on the right hand side. There is a large LED sign in front of our office. go north approx 5 km to our office. On March 19, 2014, Colm Maher President of The Northumberland Chapter of the Council of Canadians advised the Northumberland County Council that they passed a resolution supporting the PHR4MWR’s opposition to the building of a garbage incinerator in Port Hope. Northumberland County Council meeting on March 19th, 2014.
with the proposal to burn garbage in our County. Dr. Stan Blecher has been invited by another local Council to make a presentation regarding opposition to the Entech-REM incinerator proposal. This invitation is in stark contrast to the Municipality of Port Hope, who initially confirmed dates for 2 presentations, but then revoked them, and told local residents that they needed to wait for a public meeting in order to make a presentation about their concerns. Once again, it would be a great show of support to have a big turnout and use the opportunity to make the best of this platform. Members of the press will be present, and hopefully will continue to report on these important presentations. Thursday March 6, 2014, at 3:00 p.m.
And then add your comment, share and write a letter to the editor of Northumberland Today. Hamilton Township has passed a motion inviting Dr. Stan Blecher to make a presentation to their Committee of the Whole meeting next week on Tuesday February 11 at 1pm. The Northumberland Chapter Council of Canadians has resolved to support Port Hope Residents for Managing Waste Responsibly (MWR). We have prepared the following notes to rebut the misinformation that REM’s president, Mr. Lewis Staats provided to the author in this Toronto Star article by Raveena Aulakh titled “Port Hope residents worry about garbage incinerator”. Published in the Toronto Star on Saturday January 4, 2014. With the help of many local residents, Port Hope Residents 4 Managing Waste Responsibly (MWR) recently submitted a very thorough Elevation Request to the Ontario Ministry of the Environment. This is a formal request that the proposed ENTECH-REM incinerator project should be subject to a higher level of scrutiny by the Ministry – a so called “Individual Environmental Assessment”. Please take a moment to look at our Elevation Request , it lists in detail the many risks posed by the proposed incinerator, and ENTECH-REM’s failure to address our concerns. Also, please read the two-page document which lists some of the “highlights” of our elevation request. The Ministry of the Environment will be making a decision on our Elevation Request by December 25, 2013. Over the next few days, please e-mail Premier Wynne (at premier@ontario.ca), and the Minister of the Environment Jim Bradley, (at minister.moe@ontario.ca) and let them know that you support MWR’s Elevation Request and that you oppose the proposed ENTECH-REM incinerator in Port Hope! Is Port Hope a guinea pig? of Environment and other government departments, agencies, and groups. An article in the Northumberland News on how the proposed incinerator could affect the businesses of farmers growing natural grass-fed beef. A recent Toronto Star article about Markham and it’s waste management practices, quoting Claudia Marsales about how they are now at 81% diversion from landfill. This is a plan that we support, and have encouraged our County to consider this type of waste management plan and not one that sends our waste to be burned in an incinerator. A recent article in the Northumberland Today where Mayor Thompson said that Ms. Claudia Marsales has agreed to speak to Northumberland County’s waste management advisory committee in September, but no date has been scheduled as of yet. We will inform you of the time and location once we have that information. 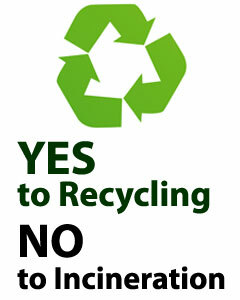 REM has never built or operated an incinerator or any other type of waste disposal facility. The company has no track record. The Entech technology REM proposes to use in Port Hope has never been used in North America or Western Europe. There are serious health concerns surrounding this type of incineration technology, including the release of dangerous nano-particles into our atmosphere (for further information, see our health concerns page). The incinerator proposed for Port Hope would be by far the largest in the world using this technology. Hundreds of thousands of tonnes of garbage from other communities would be trucked into Port Hope annually, amounting to hundreds of trucks of garbage a week destined for our community. Port Hope council has just spent over $100,000 to re-brand our town and protect it from the stigma of toxic waste. Trucking hundreds of thousands of tonnes of other communities’ garbage into Port Hope to be incinerated blatantly contradicts this re-branding effort. Port Hope’s reputation, along with tourism, local business, and property values will suffer from having a large garbage incinerator in the community. Learn why our community organization, Port Hope Residents for Managing Waste Responsibly (MWR) is opposed to the proposal by a private company to build a large garbage incinerator in Port Hope. Learn how you can get involved. Please do not hesitate to contact us if you have any questions or comments. Please check back for important upcoming events, including key town council meetings. Please see attachments for the notices from the Municipality of Port Hope about the meetings.